In this article, I'll describe -- and show pictures of -- some of the significant additions that have been made available to programmers in the MFC Feature Pack for Visual C++ 2008. These same feature are in the MFC libraries that come with Visual Studio 2010, which is now in beta. There are really too many new features to cover in even a long article, so I'm going to single out a few things that I think may have an important impact. While all of the world seems to be gravitating toward a browser-centric programming model, lots of us programmers in the trenches know that there is still, and always will be, a place for desktop application programs and "thick client" application software. 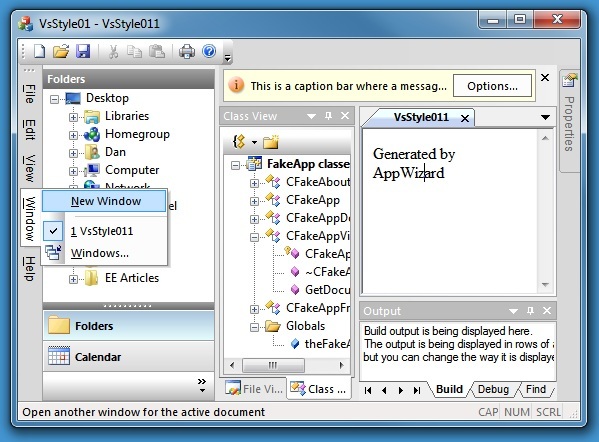 MFC provides the toolkit for serious desktop application programmers. The most visible (visual) additions to MFC is support of a U/I feature that is associated with the slick Vista/Windows 7 "look" -- actually the look of Microsoft Office applications. That look includes a "ribbon" rather than, or in addition to, an old fashioned menu bar. Now you can create an MFC application program with the same scatter of gadgets and gizmos at the top. The "Vista Orb" or "Pearl" (what I think of as the marble) in the top left corner really basically equates to the old "File" menu. And the "ribbon groups" equate to menus, but in a graphical way that makes them a sort of combination menu and toolbar. The way the AppWizard works for creating these template apps is that it throws in everything, including the kitchen sink. If you don't want a feature (such as a dockable tree pane), you remove it from the program. 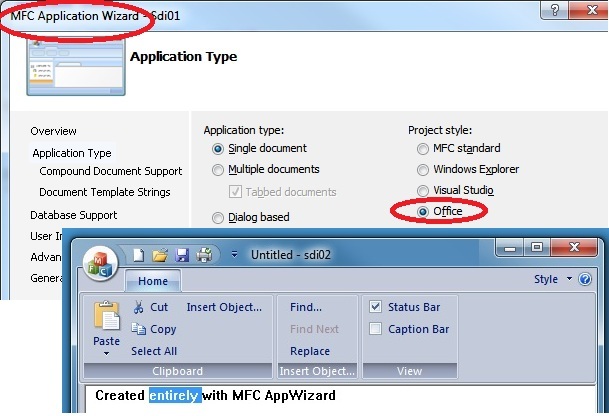 One result is that every AppWizard-generated program is a very detailed example of lots of new features. Basically all of the U/I features that you see in the Visual Studios IDE are are now available for use in your own programs: Panels that dock or float, panel groups with tabs, MDI interface that uses tabs, hide-away panes that collapse against the sides or you can "pin" open for repeated use (my favorite feature). It seems like overkill to put so much into an AppWizard-generated program. Trees and other panes are populated with fake items and tabs are given names that will have no meaning for your own program. But I actually like what they've done. It is very easy to replace the simulated content with your own, since you have example code that shows how to do it. It is also very easy to remove a feature that you don't need (i.e., most of that stuff). Did you notice how the menubar is positioned sideways in that figure? Before taking the screenshot, I dragged the menu bar and let it snap to the left side of the client area. There is a new class, CMFCMenubar that handles that automatically. It basically simulates a traditional menu, but puts it all inside of a user-configurable buttonbar-type panel. The same support exists for traditional toolbars and for all of the other panes you see there. As a user, you can float them and reposition them however you like. You can even float a panel outside of the application window altogether -- which lets you take advantage of the screen real estate on your second (or third) video monitor. If you have ever handled any of that U/I overhead yourself, you know that it can get terribly complicated. Just keeping track of how the user set things up in order to reproduce the layout later is a big pain. So MFC now provides new tools just to keep track of user customization actions. It is all tied together, and that AppWizard-generated program will automatically recall tools a user adds to the toolbar(s), menus and sub-menus he's added to the menubar, locations and states of each of the panels, and the main window location -- all without the programmer needing to add a single line of program code. Is all that user-customizability just too much? What happens if your user hides the critical panel? Are you going to get a lot of support calls? Is that window too complicated? Yes, Seek comfort from Cap'n Morgan, Yes, and Yes. But I think that there is an underlying method to all of this madness. Webbrowser-based apps are bound to be relatively simple and offer limited functionality, supporting only the kind of customizations that can be done with a cookie. The remaining programming niche -- desktop apps -- is for full-featured kitchen-sink programs with truckloads of bells, whistles, and -- you-guessed-it -- user-customizable panels. This is a sexied-up pushbutton. You can assign two images (one for mouse-over "hot" look) and you can easily set a tooltip and show the button with or without the button text, below or on either side of the image. There is even an auto-repeat option. This is a button that when clicked displays a pop-up menu. 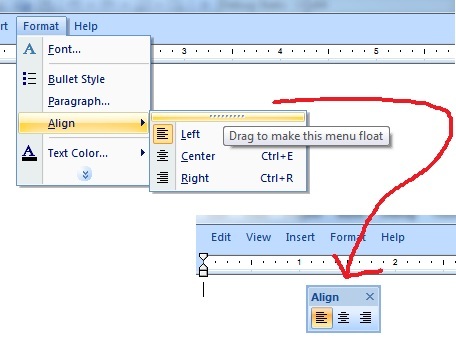 It can be set as shown with a vertical bar so that clicking the arrow pops up the menu, while clicking the body of the button executes the default action (the most recent menu item selected). That's very handy in certain situations. Select a font without going through the rigmarole of a dialog box. One option displays the fonts as shown -- each selection is drawn in its own font face. Here's an often-needed combination: An Edit control with a built-in "browse to locate" button. Two common types are provided to let your user browse to locate a particular file or a particular folder. The "custom" version would let you browse for, say, a printer, a database, a network resource, or anything at all. This packages and simplifies the "report-style" version of the common ListView control. 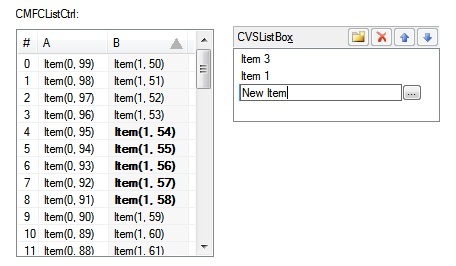 It adds a number of handy features, including built-in sorting (and display of an arrow-decorated sort header) including multiple-column sorting. It also lets you display specific cells in a desired font, color, and/or background shade. A user-editable list control. It lets your users put the items in a desired order by moving them up or down in the list. You can let the user add or delete items. There are standard buttons for these actions and you can add new buttons (for instance, a "disable but leave in the list" button came in handy in a program I wrote recently). Here's one that most GUI programmers have had to write themselves at one time or another. You want the user to input data in a certain format... say a phone number or a Social Security Number, or a product serial number, etc... and you'd like the control to enforce certain character types at certain locations, while filling in certain literal characters as well. This new control offers great flexibility. You set up a mask with ds and cs (and a few other characters) to identify which types of character can be input and where. Then you can provide a template with any characters you want to be shown in the input box and underscore characters (_) for input character placeholders. For instance, the code below sets up the masks for the two input boxes in the above figure. The GetWindowText() member has been overridden to extract just the user input... so this works perfectly (and automatically) with MFC's DDX_Text() (Dynamic Data Exchange) handling. Here's a little feature that sort of illustrates how far the MFC coders went toward whiz-bang user customization. You can create a menu that your user can "tear off" and turn into a floating palette. 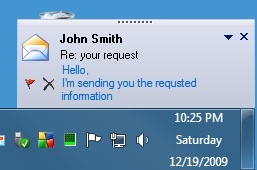 The now-standard way to inform your user about updates, task completion, or other important information is to display a small box near the status tray in the taskbar. MFC supports this with all imaginable options -- animation effects, semi-transparency, user controls, auto-close timing... In fact, your little notification box can be entirely customized by using a dialog box template. These are standard Tree and List controls that have been enhanced to automatically provide views of all Windows Shell objects. 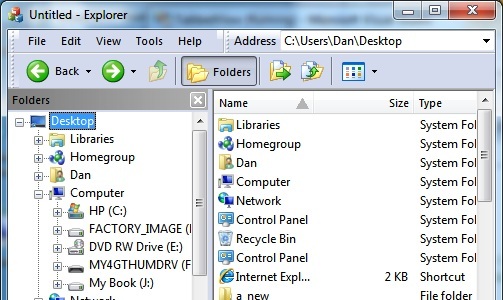 If you have ever gone through the process of reproducing your own version of the Windows Explorer, you know that handling PIDLs can be a complex task. This makes it effortless. I found it unusual that the sample projects (and the AppWizard-generated projects) all show the tree with the old-fashioned "pluses and dotted-lines" look rather than the new-fangled Win7-look trees. But even then, they would refuse to install. So I used WinRAR to break out the files from the download distribution EXE. I understand that if you download the VS 2010 beta, you will get the full set of "Feature Pack" sample projects, so you might consider going that way. Note, however that VS2010 solution and project files are not compatible with VS2008.